Home Myphone Tech News OneHeart, OneBeat, OneVoice a concert for Survivors! OneHeart, OneBeat, OneVoice a concert for Survivors! 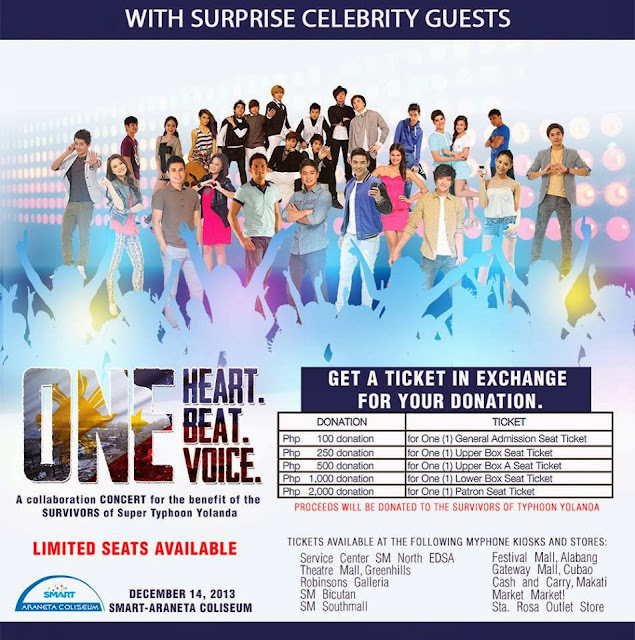 Myphone will be launch a benefit concert for the survivors of Super Typhoon Yolanda on December 14, 2013, 7PM at Smart-Araneta Coliseum, the theme was "OneHeart, OneBeat, OneVoice". Popular artist will perform at the concert including the multi-awarded and Myphone endorser Coco Martin, the heartthrob teen star and also a Myphone endorser Daniel Padilla. Plus , with surprise celebrity guest! So what you waiting for? Buy your ticket now to get a chance to meet your favorite stars! This will also serve as your donation on our fellow Filipinos in Visayas.